A mid-century doctor's raw, unvarnished account of his own descent into madness, and his daughter's attempt to piece his life back together and make sense of her own. 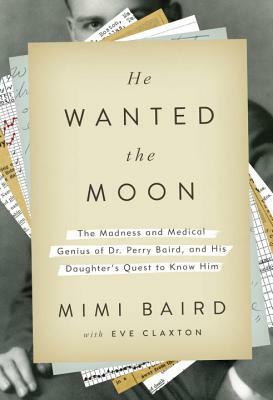 Fifty years after being told her father would forever be ill and away, Mimi Baird set off on a quest to piece together the memoir and the man. In time her fingers became stained with the lead of the pencil he had used to write his manuscript, as she devoted herself to understanding who he was, why he disappeared, and what legacy she had inherited. The result of his extraordinary record and her journey to bring his name to light is He Wanted the Moon, an unforgettable testament to the reaches of the mind and the redeeming power of a determined heart. Mimi Baird, a Bostonian, is a graduate of Colby Sawyer College. After working at the Harvard Graduate School of Education, she later moved to Woodstock, Vermont, where she worked as an office manager at the Dartmouth Hitchcock Medical Center. There she met a surgeon who had once known her father, a meeting that prompted her quest to finally understand her father s life and legacy. Mimi has two children and four grandchildren. This is her first book. Eve Claxtonwas born in London. She has been instrumental in creating six works of non-fiction as a co-writer or ghostwriter, and is the editor ofThe Book of Life, an anthology of memoir.She also works with StoryCorps, the National Oral History Project featured on NPR. Eve lives with her husband and three children in Brooklyn."